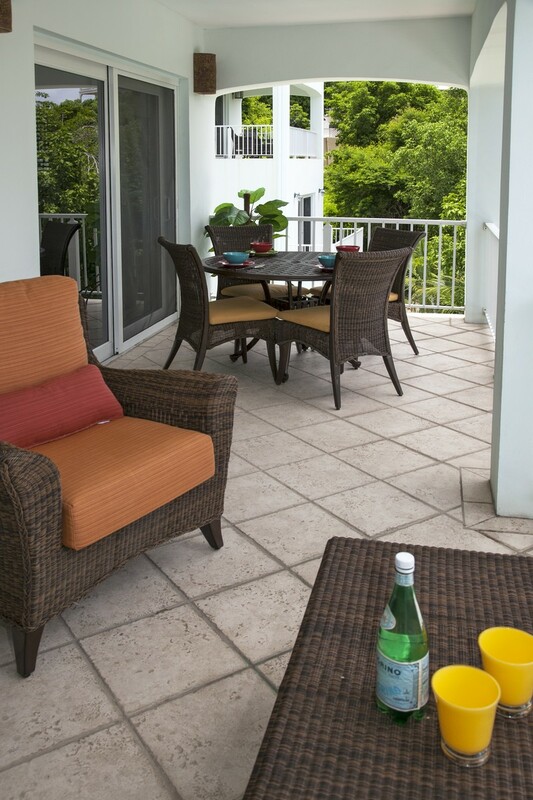 Set among the blooms and palms in the courtyard at Palm Terrace Villas, Bougainvillea is an elegant, stylish and extremely comfortable accommodation for up to 6 guests. 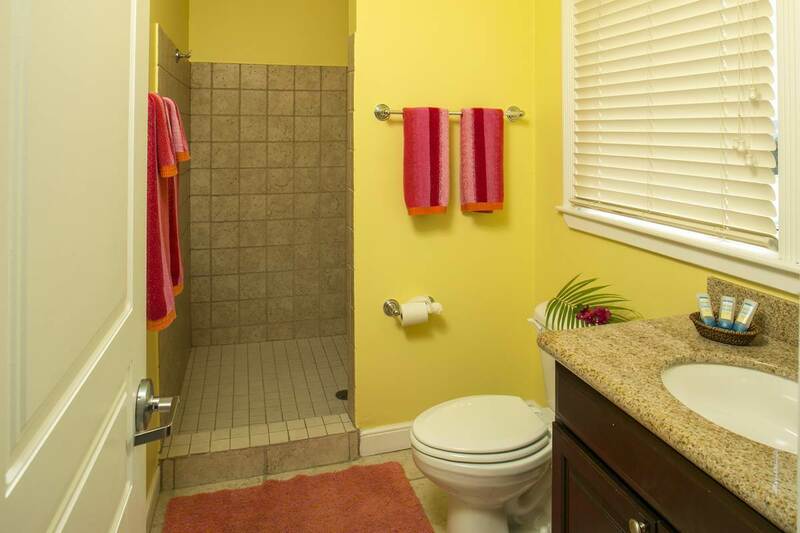 With 3 spacious bedrooms and baths, this home is airy and beautiful. 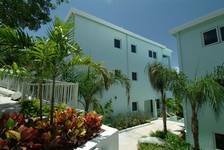 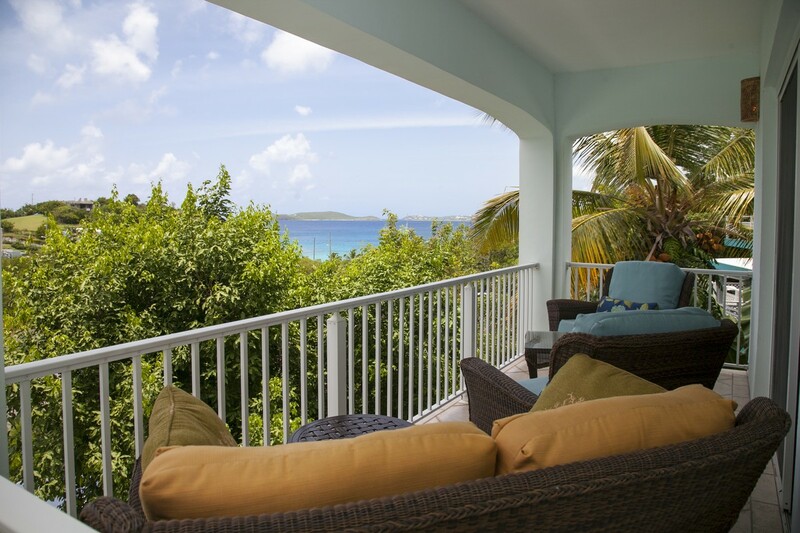 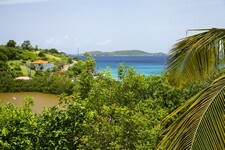 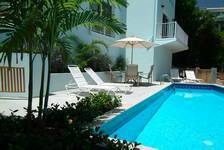 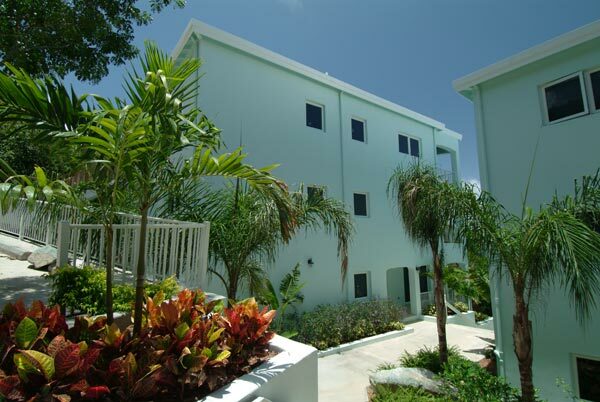 With over 2000 square feet of living space, all on one floor, you will not find a nicer condominium on St John. 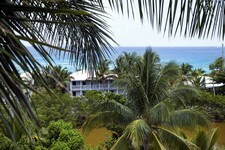 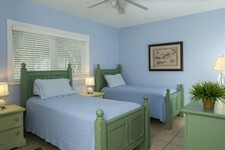 Painted in breezy hues and elegantly furnished, Bougainvillea offers guests 3 large bedrooms, all with ensuite baths. 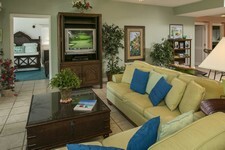 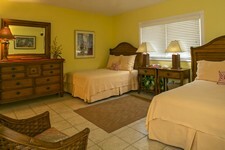 The master bedroom is located just off the great room and has a wonderful breezy private veranda all to itself. 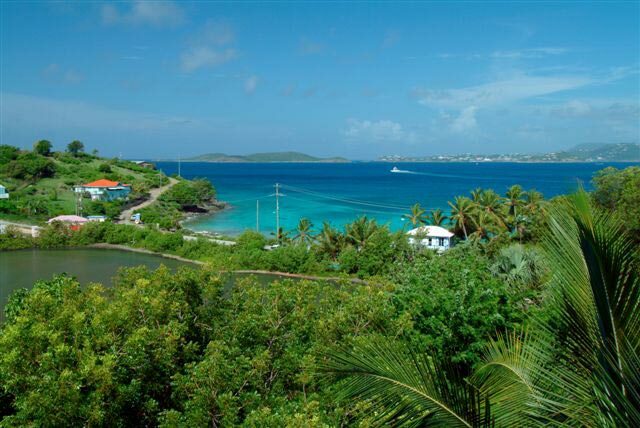 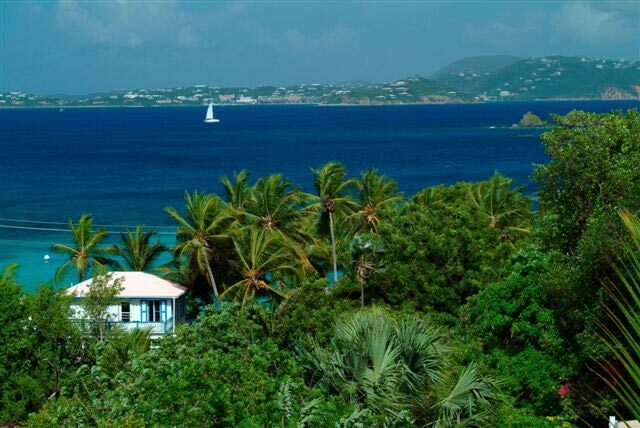 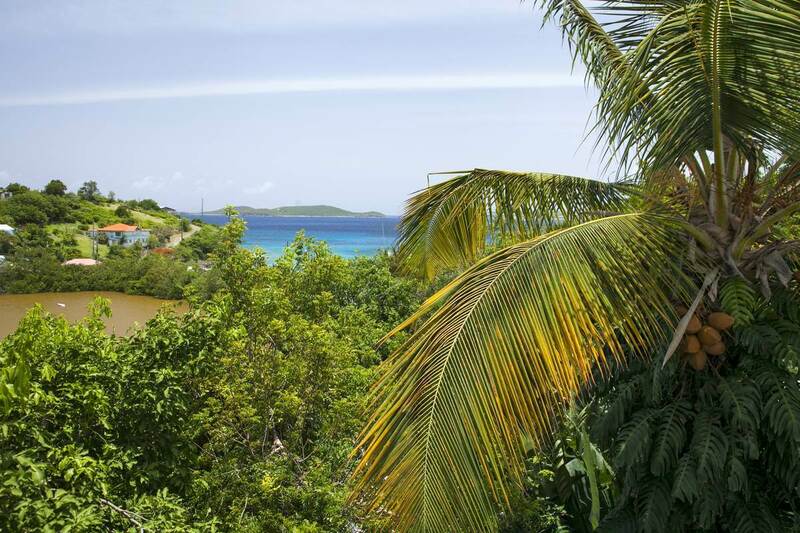 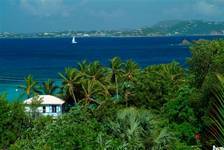 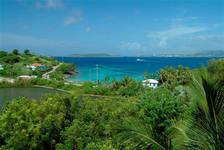 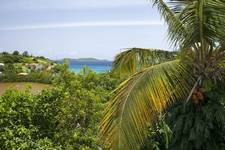 From here you can enjoy the twilight hours over the Caribbean Sea and the sparkling lights of St Thomas shimmering to the west. 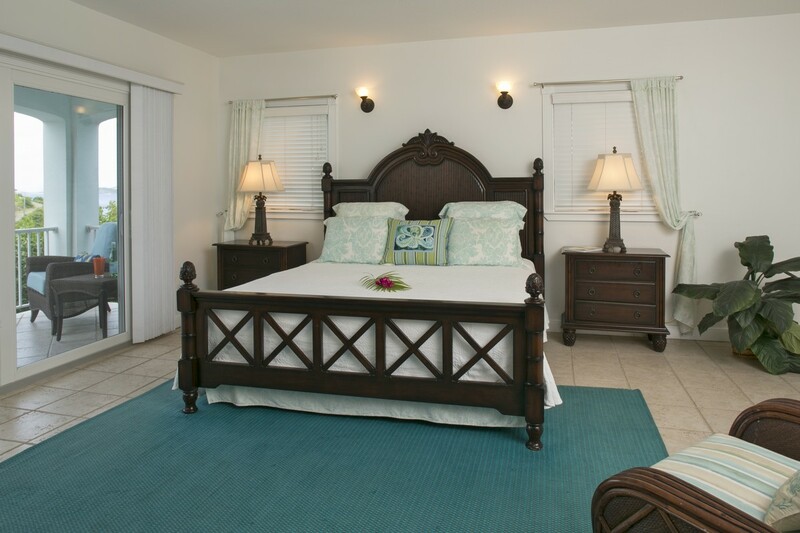 A richly carved 4 poster bed in deep mahogany is the perfect place to sleep the night away. 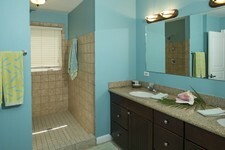 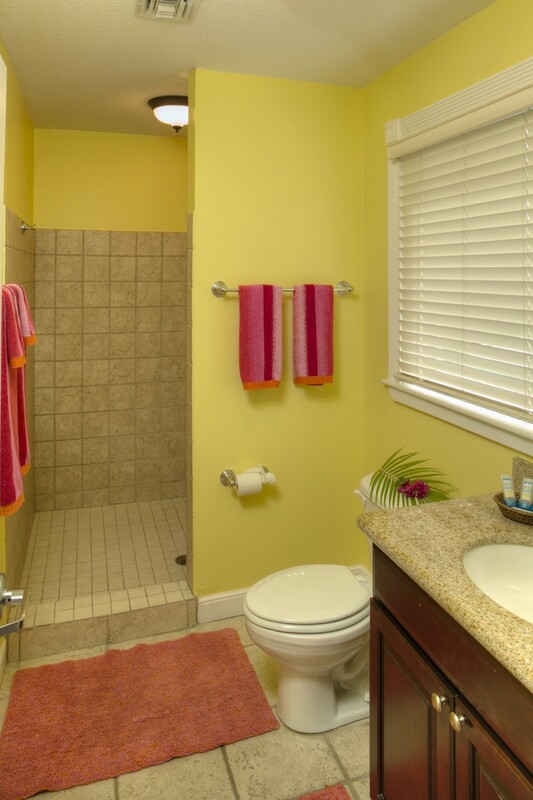 The spacious and well appointed bath has granite surfaces and a huge walk in shower complete the suite. 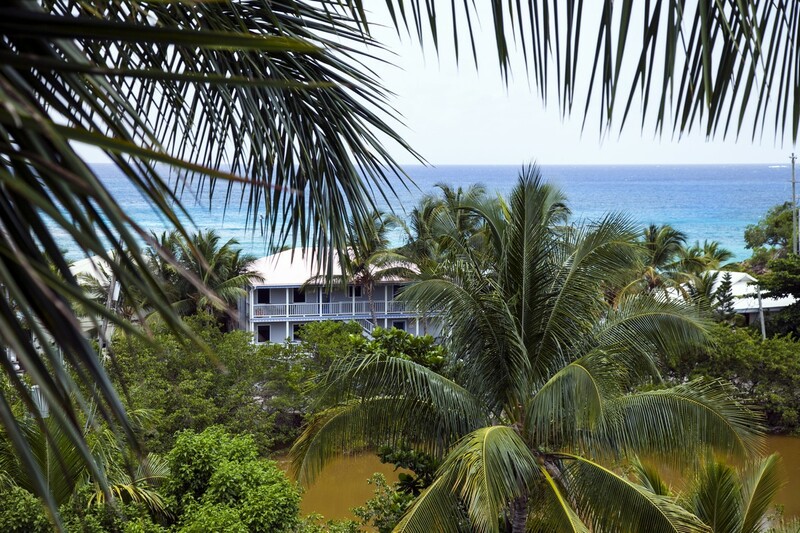 Two additional guest rooms offer 2 full size or 2 twin size beds each, both with ensuite baths and both professionally decorated with a tropical hand. 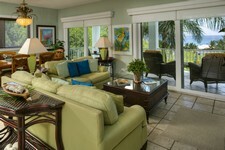 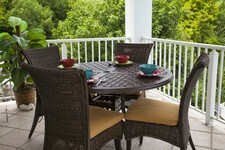 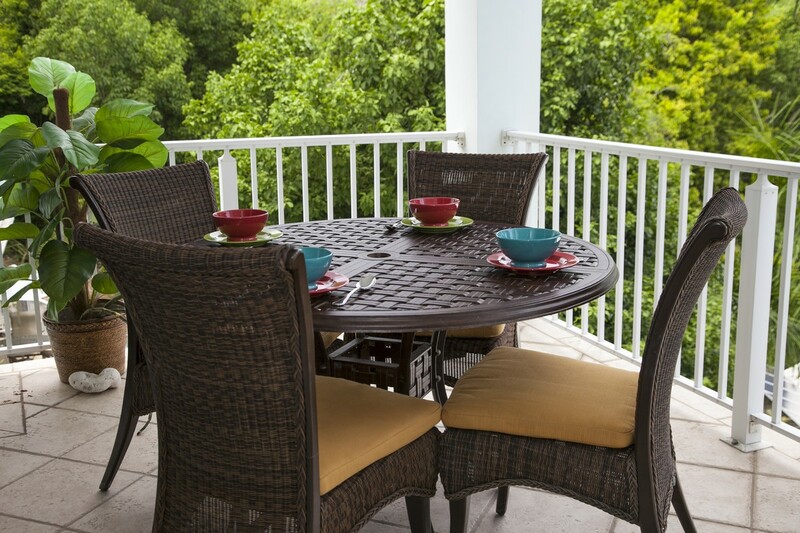 This unique configuration offers perfect accommodations for couples, singles and families alike. 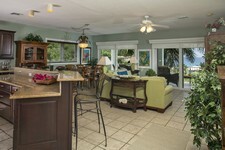 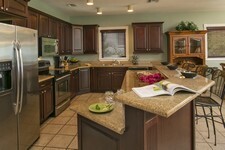 The heart of the home is a large open air great room that invites happy gatherings. 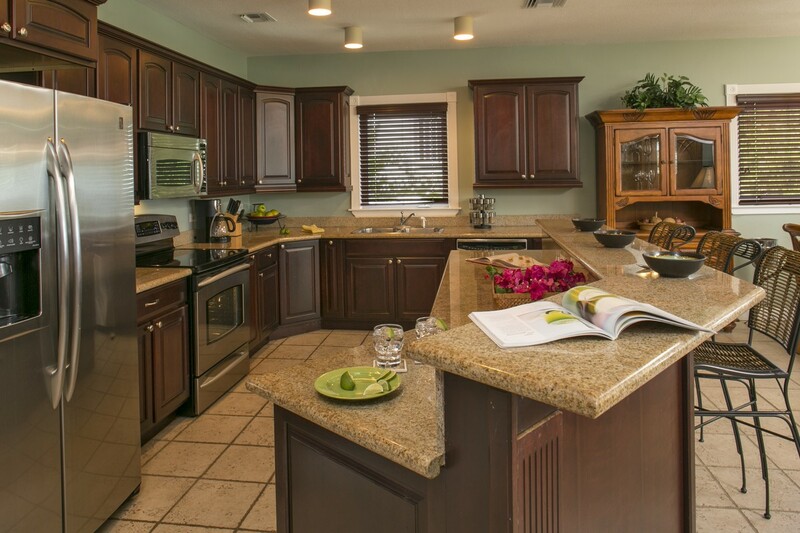 A completely equipped gourmet kitchen is designed with mahogany cabinets and granite countertops, and is open to the living space by a large breakfast bar. 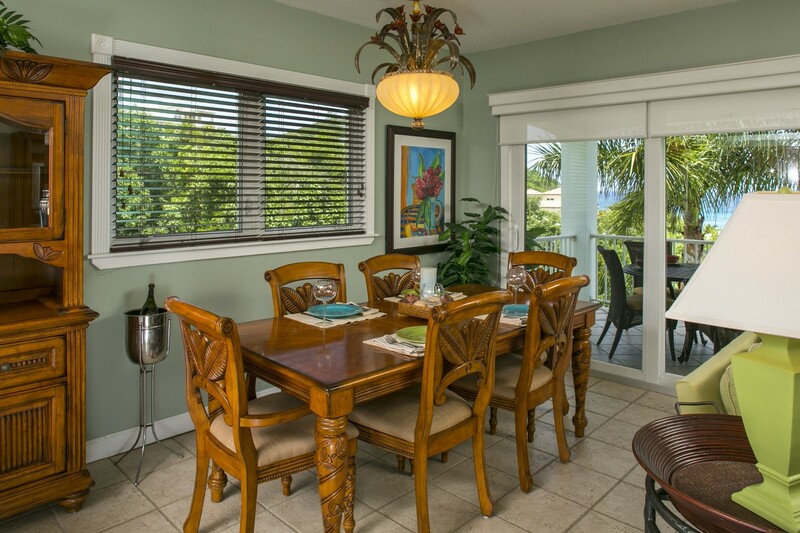 The great room itself houses an elegant formal dining table, complete with attractive dinnerware and complimentary linens for an elegant dining experience for up to 6 guests. The sitting area is inviting and pleasing to the eye, with comfortable seating in large deep sofas and well designed accents, all presented in the cool blues and greens of the Caribbean Sea. In fact, the entire villa is full of personal touches and original island inspired art that make this condo a a truly elegant island home. A large and breezy covered terrace spans the entire length of the great room and is accessed by 2 large sliding glass doors. 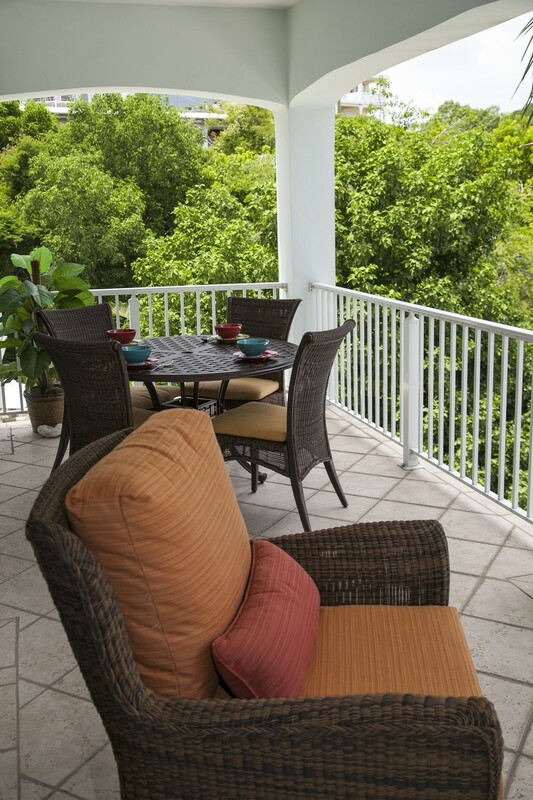 This outdoor living space has an alfresco dining table and chairs as well as a comfortable settee that beckons to stay awhile and drink in the glorious views and balmy breezes. 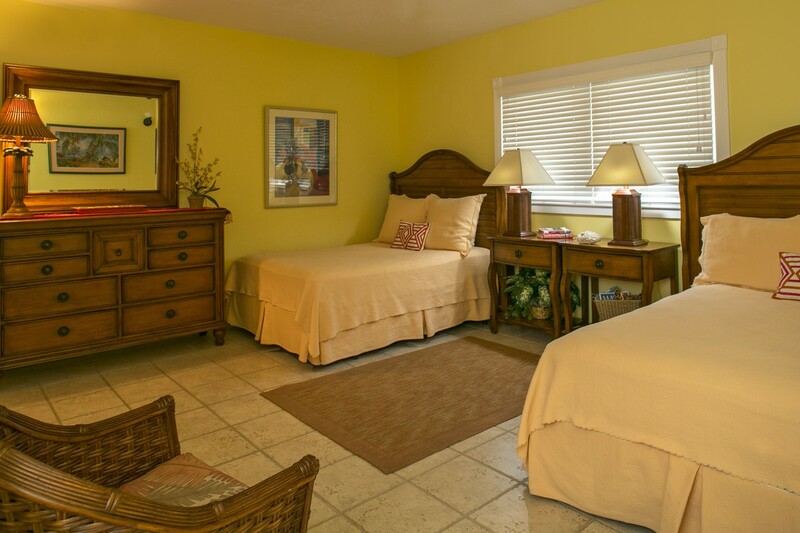 Bougainvillea is completely air conditioned and offers all the creature comforts you need, from cable TV and free WIFi, to a fully equipped laundry room. Beach chairs, coolers, and towels are there for your use at our world class beaches or cool and inviting pool… The perfect retreat after a day of adventure or beach hopping. 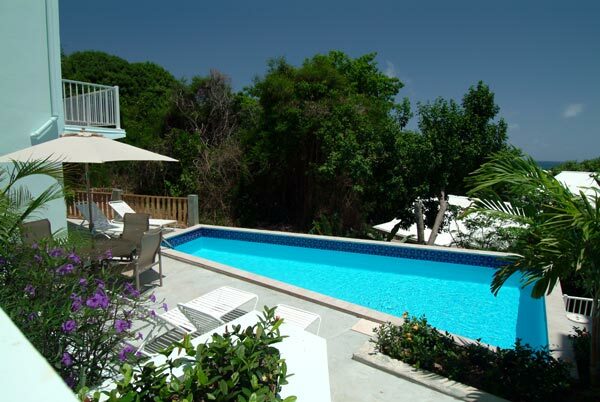 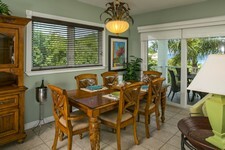 Bougainvillea — elegance, comfort, amenities… this beautiful villa has it all!